I came up with this idea while I was working on my game engine few years ago. There is huge resources in the web about pathfinding, especially for A* , but I wanted to create something myself, so here it is. I hope you'll find it useful. The applied demo program and code are written on VB 2010, however, the logic of 'FirstWins' pathfinding is not program-specific. You should be able to adapt what's here to any computer language. This means that all active branches will be sorted by their distance to the end point and the searching will start from the branch that is closest to the end point. This means that path finding will start from the branch that meets the full priority of the branching. If start.x > end.x then the priority for x is X- because in order to get to end.x, we will have to decrease the value in start.x. Vice versa if start.x < end.x, then the priority for x is X+. If start.x = end.x, then the priority is 0, we don’t need to change the value in start.x in order to reach the end. The same rule applies for the Y axis. 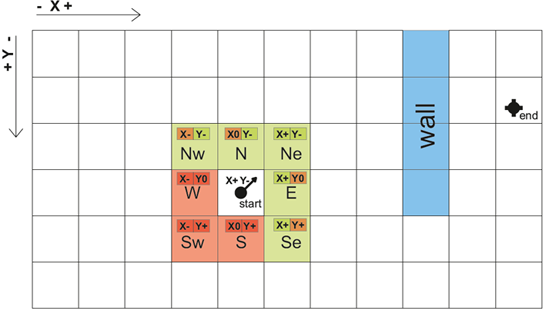 As you can see, in order to be a suitable position for the next branching, the square doesn’t need to meet the same directions as the priority. It’s enough that only one of the axis has the same direction. The next sub-step is to check if the priority points are free, e.g., there are no walls, other objects or if these points haven’t been examined by other path-searching branches from the same family. Next, we branch to the free positions. Each new branch remembers its parent position. This is important because this data will help us trace the path back to the destination point, when that branch reaches the end. 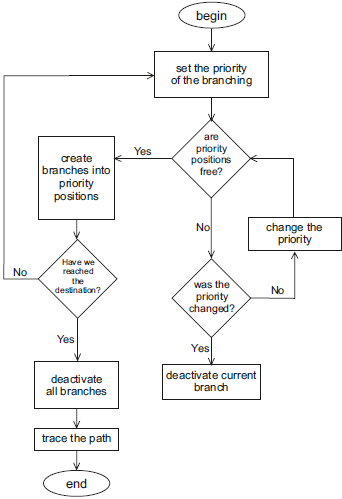 If none of the priority positions are free, then the branch will switch its priority. The ‘+’ will become ‘-’ and ‘-’ will become ‘+’ , then we perform step 2 again, but this time using the new priority. Inactive branch is a branch that doesn't have suitable positions to reach, or its branches are already spread into the suitable positions and there are no more actions for it to perform. If the branch has reached the destination point, it will also deactivate all other branches and will retrieve the path to the destination. According to the algorithm's logic, the first branch to reach the end point is the relatively shortest path. However, the solution might not always coincide with the mathematically shortest path. 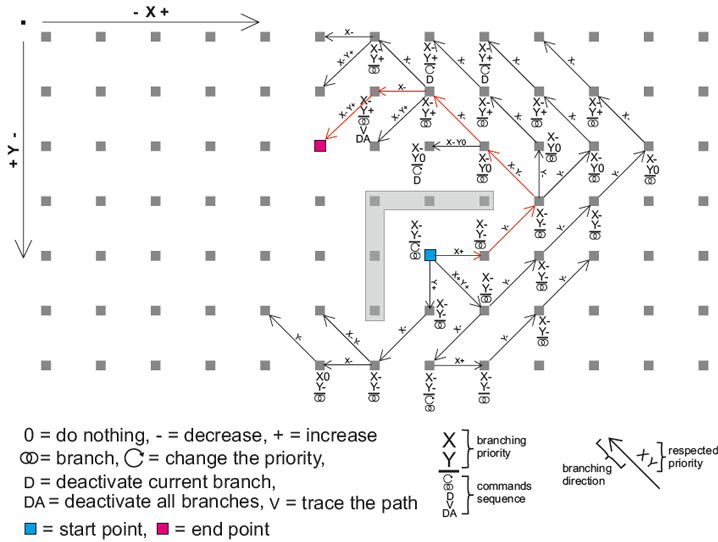 The ‘branching priority’ is the mechanics that make the pathfinding process more controlled and less branched out. The implementation of the algorithm in the applied demo program (PathfindingDemo) is very basic and sometimes buggy and inaccurate, its primary intent is to show that the algorithm just works, nothing more. Most of the problems with pathfinding in the demo program are related to the coding, not to ‘FirstWins’ algorithm. I believe that due to its simplicity, 'FirstWins' could be enhanced and optimized in many ways. Any suggestions and ideas from you are more than welcome. - added path optimization function that reduces the 'jumps' and 'drops' in the discovered path. the speed of the moving path-trace object: the lower the value is the faster the object is. I'm an enthusiast game developer. I love computers, art and science. While A* is probably still more optimal or deterministic this is definitely an interesting approach, and it's nice to see someone experimenting off the beaten track. Nice and thorough article. Considering you are moving from centre square to centre square, have you tweaked the algorithm for the step length (or distance) travelled per step? I wonder how much this would affect the routines. After all, for a square edge length of 1 unit, the diaganol step would be √2 units. I had a quick skim through the routine and it looked like you were assuming a diagonal step of equal weighting to straight step. Just curious as to how much of a difference it would make. It seems to me you base your logic on your previous knowledge of A*, but both algorithms are founded on different premises. FirstWins is designed to find the shortest distance without having the need to take into account whether the step is diagonal or straight as long as it falls in the general direction of the set priorities. Use a hex map[^] instead. In acoustics (Transmission Line Matrix for Acoustic Simulations[^]) it dosen't make much difference provided that the grid is small enough compared to the wavelength, should expect the same here I guess. Was the feature article and I saw your post. Other might have the same question so.. Does this saves over regular Astar ? Well this one looks great. Good job on this. I am willing to implement it in some other language, when I can find some spare time. A question, though. Have you compared it to classical Astar ? Is it much more efficient ? Faster ? Re: Does this saves over regular Astar ? I'm very busy working on two jobs and I didn't have the time to write A* implementation to make a comparison, but I think it have the potential to be faster because it relies on much more simple logic and the calculations needed for the 'FirstWins' are also more simple - basically it only compares two integer values and then add or subtract again from integer. Thank you guys for the votes and for the interest, I hope someone will find a spare time to make some benchmarks between other pathfinders. Article Copyright 2012 by O.G.I.